How to get there From Bormio (1200m) to the north there is a very beautiful and often quite steep road that leads to the pass. For the most impressively steep road going to the pass, which is often up to 16% one starts south of the pass at Ponte di Legno (1298m). You start there if coming down the Passo del Tonale (1882m), but if coming down from Passo di Aprica (1174m), Monte Padrio (Valico di Trivigno) (1867m) or from Passo di Guspessa (1821m) you start in Edolo (687m). 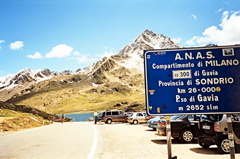 You could also have come down from the Passo della Foppa/Pas de la Foppa (Passo del Mortirolo) (1855m) and started at Monno/Ponte dei Pellegrini (892m). Other comments This road was fully paved in 1998, but was used even before that in Giro d’Italia (and was obviously very difficult for the riders back then). This is one of a few passes I must give full points for beauty. Prepare yourself with water before the climb. This pass was included in the Gran Fondo Marco Pantani (that I did in 2006). See also Jobst Brandt’s description (day 11). The asphalt was a bit bad in 2016, like most elsewhere in Italy as of late.